How do we know anything? There are three accepted methods to acquire primary knowledge: Philosophical based on Reason, Scientific, based on Observation plus Reason, and Religious based on Belief. However, upon closer inspection, these three methods show strong dependencies. Philosophy and Science (i.e. Scientific Method) require Belief that Reason is a valid method to acquire Knowledge. Philosophy also requires axioms – Beliefs that are the seeds of Reason, while Science requires Belief in the extrapolation of the Observable. Since Philosophy requires both a Belief in the axioms and a Belief in Reason as valid method to acquire Knowledge, Philosophy is indistinguishable from Religion and can best be viewed as a subset of Religion (becomes Religion if addresses the Fundamental Questions). Belief is the first and most complete layer of all Knowledge, while Reason and the Observable form the second – smaller and third – smallest layer of human Knowledge. A random question probing our Knowledge can thus hit a point on our Knowledge Map that can be a blank (“don’t know”), our Religion/Philosophy (Belief) or our Science (Belief plus Observable). Since we all have different Beliefs, each person has his/her own Knowledge Map even when we all agree on the Observable. Is Reason paired with the Observable all we need? No! Reason is not objective like Logic which is just part of Reason along with the much more subjective Framing (Fact Selection, Assumptions and Results Interpretation). There is no “Reason” but billions of Reasons each belonging to one particular human – two or more persons reasoning about the same Observable, usually reach different conclusions. Individual Reasons are built from individual Observations and Beliefs, hence the three layer Knowledge Map is better represented as a two layers map composed of the Observable and Belief. This Map of Human Knowledge is a 2D simplification: horizontal axis is Space-Time from infinite small and infinite past to infinite large and infinite future with an origin point in the present and human size. The Observable is the set of discrete (dimensionless points) Observations and Virtual Observations (dark gray area) that stretch from the subatomic to the end of the visible universe and from the beginning of the human history to present. We don’t know the future even one second from now, but we will extrapolate (a Belief) to fill some of the past gaps and into the future. Is Science in conflict with Religion? No! Religion is an integral part of Science. Extrapolation is a Belief that helps us stretch the Observable thinner and thinner, thus forming our Religious Beliefs as we get further and further away from the Observable. Since Religion is the base layer of our personal Knowledge and part of the individual Scientific views, to the extent that we all agree on the Observable, “Science in conflict with Religion (or Philosophy)” is instead a “conflict between individual Religious Beliefs”. Science is never settled – if it were, discussions and scientific progress would stop. Scientific commentary is too often presented as entirely based on the undisputed Observable. Yet Facts Selection, Assumptions, Interpretation and Extrapolation of the Observable are all Belief components essential to conclusions. Proper disclosure would require listing all assumptions, competing hypotheses, confidence levels for each of these hypotheses and the Religious inclination of the presenter which would inform the audience as to what set of hypotheses were excluded from research. What about the Truth? Is the Observable just a known portion of the Truth? If so, would the full discovery of the Truth make Belief obsolete? The full Observable is not accessible to humans given our many limitations. 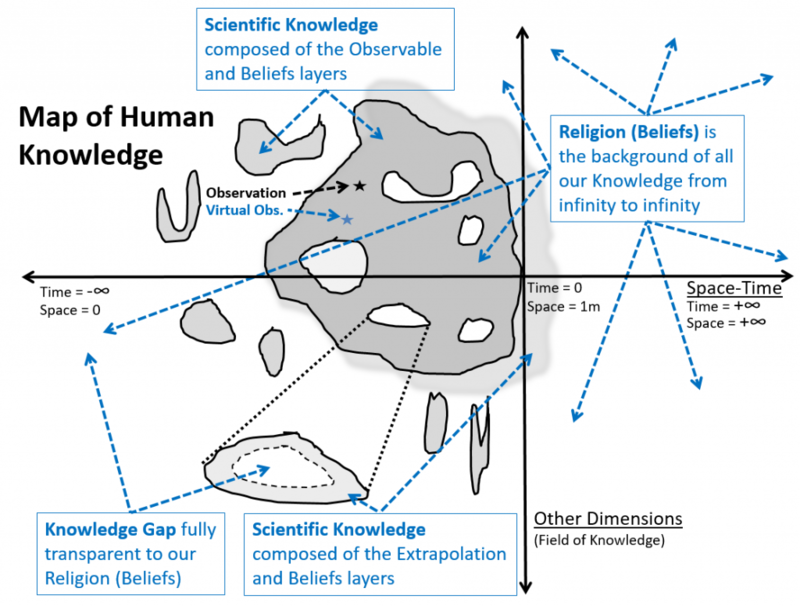 Our Knowledge map will thus always require both a Belief and an Observable layer. But even with infinite Observable, we would still need the Belief to interpret the Observable and reach infinite Knowledge, also known as the Truth. The infinite Observable (imaginable but unattainable) without the Belief would be just a sterile and meaningless instruction manual. If Belief covers the whole Knowledge Map, why do we even need the Observable? We cannot reject the Observable even if we wanted. Besides, a Knowledge Map is not possible with just one layer. The Observable is a validator of our Beliefs – the larger the Observable layer, the more validated the Belief. A conflict between Observable and Belief has to be settled in the individual mind or else the Knowledge Map loses its usefulness. The Observable layer may be shared by many individuals and is paired with distinct individual Beliefs resulting in individualized Knowledge Maps. Con: Only a subset of all possible assumptions will be in any way religious. My assumption that my watch is telling the right time for example is not religion. Pro: Religion is a particular system of faith and worship. Faith can include Darwinism, materialism, the immutability of “the physical laws”, etc. and of course our common faith in the accuracy of the watch and the train arriving on time. Con: Science = a systematic set of safeguards against biases. Pro: How do you reconcile your definition with the fact that everyone is in fact biased? And what about the Axiomatic Beliefs that are the base of all human reasoning and that cause perfectly “reasonable” individuals to disagree with each other all the time? Also, Max Planck said that Science Advances One Funeral at a Time. This is often quoted not because Planck was so great (he was), but because it continues to ring true. Con: An axiom is traditionally defined by building upon a readily observed set of facts that can be mutually agreed upon. Pro: Axioms are compatible with the Observable, but not “building upon a readily observed set of facts”. Axiom is the original belief that cannot be proven, yet taken as true – aka religion. Con: Science and dogma, of any stripe, are utterly incompatible. Pro: Arguments around Science are useless because Science = Observable + Religion. Facts Selection, Assumptions, Interpretation and Extrapolation of the Observable are all Belief components (Religion) essential to conclusions in all scientific endeavors and no scientist will ever propose a hypotheses contravening his/her religious views. But since when was Science separate from Religion and Philosophy? Historically, all scientists were philosophers/religious and, to this day, scientists still earn a Doctor of Philosophy (PhD) title. Con: Materialism is not a religion. Pro: Of course materialism is a religion – all one has to do is to observe the fervor of its defendants in spite of utter lack of supporting evidence. Would we still debate materialism if it were confirmed by observation? Of course not. Can one even observe materialism? Of course not – if anything we see there’s no creativity in materialism and no path from random, purposeless, unguided matter to the apparent nonrandom and purposeful actions of its proponents. Con: Atheism is not a religion – see the definition. Pro: Of course atheism is a religion. Think about Buddhism and the other Eastern atheistic religions. Furthermore, there is no such thing as non-religion in anything – as soon as your philosophy ventures into the fundamental questions, it automatically becomes a religion. You can’t just define as you wish. Con: Science is a composite of observation, modeling, and prediction. The value of a theory in science is based on the extent it predicts future observations. Pro: An endless list of implicit Assumptions (Beliefs) are part of any Model. There’s no getting around these Beliefs. Trees don’t grow forever, yet linear growth Models will predict just fine for a while, but then will break down. Models of long term, hard to observe, and non-repeatable phenomenon are so dependent on Assumptions and so hard to validate by predicted Observations, that these Models generate pure Religious arguments. Con: Science is falsifiable. Theories proven wrong are discarded. Unlike Religion, Science is based on fact. Pro: No. Newtonian Mechanics has been proven false at the atomic level, yet it has not been discarded because it works just fine at the macro size. Similarly, “all swans are white” can be modified after falsification to “all swans are white, except Cygnus atratus”. In addition, ‘withstanding falsification’ is not necessarily the same as ‘confirming’ the theory. Con: Science is objective and verifiable. Logic and collective observations keep prejudice away. Pro: In theory, yes. In practice, no. Science is done by people that carry their own [Religious] Beliefs – some clearly displayed, and some hidden. Assumptions, range of hypotheses under consideration, and results interpretation are all subjective. Furthermore, humans often suffer from group think. Verification is always limited due to constraints such as the immediate space-time, accuracy, repeatability, etc. Con: Religious dogma prevents scientific progress. Religion held on to the flat earth, earth centric, anthropocentrism, and other such views against the scientific evidence. Pro: Those were the Science views of the time, not Religious views. Not “Religion” held these erroneous views, but individual figureheads and their followers. Those of other Religions (including the atheists) held similar “flat earth” views prior to those discoveries. The Pope did not speak then, and does not speak now for all Christians, much less for all Abrahamic Religions or Religion in general. Con: How about “Non-overlapping magisterial” and “God of the gaps”? Pro: The layered Map of Human Knowledge shown above is a better model. Knowledge is our ultimate goal – how we get there is less important. What appears as “gaps” or “non-overlapping” is in fact the Belief layer of Knowledge clearly visible through an incomplete Observation layer. Con: Philosophy does not require “belief in axioms”. Rather, it “posits axioms”, then explores their implications. Pro: Axiom is “simply a premise” just in theory, not in practice. Scientific measurements are always assumed (believed) representative. No one ever starts from the opposite assumption although we know each measurement is in fact absolutely unique. Con: Science makes no assumption that all natural laws apply in the same way everywhere. The scientific method just leads one to proceed as if natural laws apply as we’ve observed them to until further observed evidence suggests that they don’t. Pro: In practice, “as if” becomes “dearly held beliefs” that not only affect the assumptions but also the result interpretation. Even though we just don’t know and cannot forecast the unknown, in practice no one doubts the sun will rise tomorrow and no one ever doubts that tomorrow 2 + 2 = 4 just like today and yesterday. Pro: Can you do any science without assumptions? Do you ever extrapolate? Do you ever propose hypotheses contravening your religious views? Do you ever interpret experimental findings? These are all leaps of faith. No faith – no science. Posted in Views and tagged Belief System, Extrapolation, falsification, God of the gaps, Knowledge Map, Non-overlapping magisterial, Observable, Philosophy, Religion, Science, the truth.